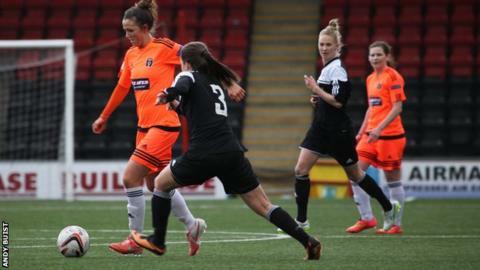 Glasgow City captain for the day Suzanne Lappin led her side to a 12-0 win over Inverness City in her final appearance for the Scottish champions. The club's record goal scorer notched her 231st goal in her 259th outing to sign off in style. Elsewhere in the Scottish Womens Premier League Aberdeen beat Rangers 2-0, and Hibernian were winners by the same score line over rivals Hearts. Celtic, Spartans and Stirling University also recorded wins. City made a number of changes from the side that thrashed Hutchison Vale 11-0 last weekend but the alterations did not disrupt the home side who once again found their rhythm early in the match, leading 7-0 at half-time. City head coach Eddie Wolecki Black said: "We asked the players to start at a good tempo, but I never thought it would be as good a half time score as it was. "We moved the ball really well with great pace and energy. We are delighted to get the victory and a clean sheet and it was a great way to send Sue off as she officially ends her career at the club, with a double figures win and that she got on the score sheet."